This article appears in two parts: In Part 1, Don Hewitt writes of his life as a ballet artist/teacher in Los Angeles for more than forty years. In Part 2, he provides an extensive overview of Southern California’s many important ballet teachers, their schools and some of their famous students. He also muses about why Los Angeles still doesn’t have a major ballet company, though there have been some strong contenders. I had been thinking about my perception of ballet and its history in Los Angeles for some time. I decided to make some notes and perhaps add something from my time there (1950-1992). First, however, I need to explain my perspective and how and why I happened to be living and teaching in Los Angeles for forty years. When I left Portland, Oregon, to study in Toronto at the National Ballet of Canada’s (NBC) first summer school in 1954, I was a teenager and had only studied three years. The training I had received was what one could refer to as “American Russian”, a solid mixture of what various performers had brought with them from the Ballet Russe companies. My teacher, Drid Williams, who subsequently received a doctorate from Cambridge University in Anthropology, was very bright and supplemented much of this with the ballet anatomy books and other materials that were becoming available at the time. There was no graded “method” available to me, such as Vaganova, Cecchetti, Bournonville or Royal Academy of Dancing (RAD) or a progressive syllabus used as at state schools primarily in other countries. My first experience at the NBC was exciting and frightening at the same time. There was a sense of urgency to establish the then one-year old National Ballet Company and every student wanted to be a part of it. The classes were difficult, competitive and large. As at most summer sessions, I learned everything I could, watched the best and was exposed to many new things. Some of the classes were Cecchetti or RAD oriented and others were “free style”, a term used in Canada for classes from a variety of materials. NBC artistic director Celia Franca taught us, as well as ballet mistress Betty Oliphant and others. There were many fine dancers and talented students attending the session. I received a partial scholarship, which included sweeping the studio and opening historic St. Lawrence Hall each day. The building was similar to Covent Garden in that it was over a market. Miss Oliphant was kind enough to lodge some of us aspirants from “the States” in her large Victorian home not far from there. In 1959 she and Ms. Franca founded the National Ballet School of Canada, which provided residences, academic instruction and ballet training. This school would expand and be regarded as one of the premier ballet training centers in the world, producing fine dancers, who often won honors at most of the major ballet competitions. I decided to stay in Toronto for the following year and continue to work on my technique, hoping to join the company. I got a job with CBC TV doing properties and continued to study with Ms. Oliphant. During the next year I performed with interns and company members in several opera ballets choreographed by Ms. Franca. (A young Robert Goulet pulled the curtain and the same year auditioned for Camelot). Later she invited me to join the company. At the time the salary was forty dollars a week, but all of the dancers were honored to join the company and earn their living dancing. We began working on the new season to be performed at the Royal Alexandria Theatre. The next year in Toronto I was asked to audition for several Musical TV series, opera ballets and a Broadway touring company of Cole Porter’s Out of This World. I had a busy performing schedule and performed on television in three series for three years in Toronto and Montreal. The union salary was very good and allowed me to continue to study privately with some of the finest ballet teachers including Margaret Saul, who was a pupil of Margaret Craske, Madame Zari from the Leningrad Academy, Elizabeth Leese, and Joey Harris, a protégé of Leonide Massine and pupil of Vincenzo Celli. While in Montreal, I performed with Montreal Theatre Ballet directed by Brian McDonald. Mr. Harris, then a noted choreographer in Canada, was asked to choreograph an hour-length musical television show called Shower of Stars in Los Angeles. When he asked me to come to Los Angeles with him as a performer, I decided to accept to be closer to my family. Unfortunately the sponsor Monsanto, due to a scandal involving the producer, canceled the series. For a time I worked as a dancer in both Los Angeles and Canada, but that became difficult. Over the years I returned to teach at York University and George Brown College in Toronto. Canada has many fine training centers and supports it’s artists well. After a short period of adjustment, Mr. Harris opened a ballet school in Santa Monica, California (1959), The Joey Harris School of Ballet, which eventually became the International Ballet School West. I had had experience teaching and found myself with a number of classes to teach as well as some administrative duties. I enjoyed seeing the progress of the students. I had also studied classical piano, so it was a pleasure to help them discover dance with the added dimension of musical awareness. As the studio quickly grew in size and reputation, so did the number of dedicated pre-professional dancers we developed. The Imperial Society of Teachers of Dancing (ISTD), London, CSB Advanced level, certified me after studying and passing a number of examinations. I wanted to make sure my students were well rounded by becoming familiar with other methods. As time went on, I incorporated Bournonville (Royal Danish) and Asief Messer’s methods (Bolshoi), among others. I studied Alexander Movement Technique and applied it and Pilates to my classes. Many of our students went on to major companies and, at the time, particularly to Europe. John Cranko’s company was very popular and several of our students also went to the Stuttgart Ballet, Frankfurt Ballet, Dusseldorf Ballet, as well as many other companies. At that time Europe seemed to offer the most satisfaction and stability for a life in the field. Later, we were fortunate to receive a number of full scholarships for students to study at our school and in New York through School of American Ballet and the Ford Foundation. One of my many memories of our school is when the British ballet star Anton Dolin came to audition a youthful John Clifford for New York City Ballet. I was recruited to take the audition with him so he would feel comfortable. In the early years, I continued to study locally and discovered a number of interesting and fine teachers in the Los Angeles Area. Dancers formerly with Ballet Russe de Monte Carlo, the Original Ballet Russe and various reincarnations of the former Diaghilev Ballet Russe and the Marquis De Cuevas Company settled in the Southern California area. Lois Ellyn chatting with Rozelle Frey during rehearsal. Photographer Unknown, from the Don Hewitt archive. In earlier times such names as Theodore Kosloff, Madame Baldina, Ernest Belcher and Rozelle Frey developed fine dancers. Frey had been in Pavlova’s touring company. Later, Madame Bronislava Nijinska, Michel Panaieff, Nana Gollner, Paul Petroff, Irina Kosmovska, George Zoritch, Paul Maure, Andrea Karlsen, and Andre Tremaine, among others, opened schools. They were, as were many composers, musicians, writers and other artists, attracted to Southern California by the climate and life style. Olga Fricker, Sheila Darby (Cecchetti) and Audrey Share (RAD) added to the immense mix of training available. Carmelita Marracci was teaching in Hollywood. She was very sought after by professionals in Los Angeles as early as the 1930’s. Cynthia Gregory, Tommy Rall and a variety of serious professionals found inspiration and technical articulation from her musicianship and imagery. She was known as a dazzling technician in her time and could bring that impeccable ballet technique to bear on an ethnic style (Spanish dance), which resulted in intensely personal works of great power. She toured for impresario Sol Hurok. Agnes De Mille was very taken with Maracci’s work and made her famous with her book Dance To The Piper. Eugene Loring founded The American School of Dance in Hollywood in the mid 1940’s. In 1965 he took the principles of his training program to the University of California, Irvine becoming the first Chairman of the Department of Dance. His goal was to develop a “freestyle” dancer that was adept in all aspects of dance. He had trained with New York City Ballet. He had his own dance company in Los Angeles and his choreography for film was sought after and extensive. He, along with Agnes De Mille, was known for developing ballets with American themes such as Billy The Kid, with music by Aaron Copland. Loring’s choreography for Broadway included Carmen Jones and Silk Stockings. The Lichine School in Beverly Hills, California was founded in 1953 by David Lichine and Tatiana Riabouchinska. Lichine, formerly a lead dancer and charismatic performer, was also a successful ballet choreographer for film and stage. His wife, Riabouchinska was one of the famous Ballet Russe’s, “Baby Ballerinas”. The other two were Irina Baronova and Tamara Toumanova. Toumanova was called the “Black Pearl of Russia”, and known for her exotic beauty. Originally a pupil of Olga Preobrajenska in Paris, she was a strong technician as well. Toumanova married and moved to Beverly Hills later in her career. She appeared in films and on the stage. I was invited to Russian Christmas at her home. She had many treasures from her career including rare paintings, jewels and honors she had accrued including a beautiful sculpture called the Prix de Paris from “The City of Light” for her performance of Giselle. Her mother, Eugenia, was famous as her companion-guardian from her early years, and both were delightful, wise and generous. Riabouchinska, among many others of Russian descent, had fled the Revolution of 1917, settling in Paris to train with famous expatriate teachers such as Alexander Volinine, Mathilda Kschessinska, and Egorova. She was noted for her performance of the “Prelude” in Les Sylphides among other roles. David Lichine created a leading role for her in his charming Graduation Ball. In Los Angeles, the Lichine school had a continental atmosphere, as many touring dancers took the professional classes alongside dancers from film and theatre. 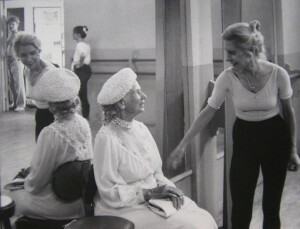 Some years later in the 1980’s, I taught the morning professional classes which included Alexander Goudonov as well as Cyd Charisse who, even in semi retirement, came in daily for barre and part of center work. Riabouchinska was a wonderful coach for many roles as well as a warm human being. It is hard to convey her particular charm, dedication and sincerity. I last saw her in her final days in the film Ballet Russe. Although there are too many memories to mention here, one of my favorites was when John Clifford come to audition Damian Woetzel at the Lichine School. I was able to rehearse him a few times in Le Corsaire before Mr. Clifford arrived. Another was when Jane Fonda was renting one of the studios for a filming to advertise her exercise attire. I had not seen her since she had taken private lessons with me in Santa Monica some years earlier. She said: “Oh Don, I am so glad you are getting out so people can appreciate your teaching”, (to crew) “give him anything he wants. He’s my ballet teacher”. Jane was always very supportive of other artists. You never knew whom you would see at the Lichine School. They were all there to be part of the work and possibly the art. Irina Kosmovska, an inspiring teacher and former artist of the Ballet Russe, also taught at the Lichine School and elsewhere. She founded the Los Angeles Junior Ballet Company, a high quality and ambitious pre-professional group. Kosmovska admired Balanchine and taught at SAB summer sessions and was ballet mistress for the Los Angeles Ballet. Many of her students such as John Clifford, Darci Kistler and others, were in the ranks of the SAB and New York City Ballet. Gene Marinaccio was well known in the early 1960’s as an excellent teacher and one of the most promising local choreographers. His ballet Into the Light with music by Benjamin Britten possessed a timeless quality that has remained fresh in my mind. His American Concert Ballet toured abroad and performed locally for many years. 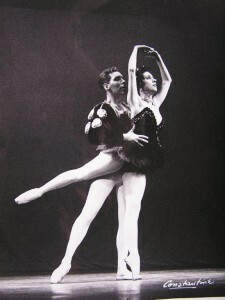 Joey Harris and Lois Ellyn in the Black Swan pas de deux. Photo by Constantine, from the Don Hewitt archive. Joey Harris’s The Group Ballet Company was established in 1970. It was critically acclaimed: “If ballet companies were race horses, I would bet on this one,” said Daniel Cariaga, of the Los Angeles Times. Mr. Harris, A Canadian by birth and a protégé of Massine, performed in New York and Europe at a young age. He took a Russian name, “required” in the 1950s: Ivan Demidoff. In his writings, critic Edwin Denby described him as “the most promising dancer in the world”. His talent for choreography won him an Ohio Award for best choreography: La Marriage, with the music of Francis Poulenc, produced on television with the Montreal Symphony. His company, The Group, performed locally in their own studio/theatre and toured. The company also appeared in other venues in the Los Angeles Area including the Shrine Auditorium in The Bartered Bride. Mr. Harris and Don Hewitt’s school International Ballet School-West (1959) and the company provided an excellent training ground for professional dancers. Dancers Thais Leavitt, Dusseldorf Ballet; Richard Fein, Elliot Feld Company, Frankfurt Ballet; and Terry Edlefsen, Stuttgart Ballet, Zurich Ballet, to name a new, received their training there. Yvonne Mounsey founded the Westside Ballet School in 1967. Ms. Mounsey originally performed with De Basil’s Ballet Russe and later Balanchine’s New York City Ballet (NYCB). She established many well-known roles with the NYCB. She and her partner at the school, Rosemary Valaire (formerly with the Royal Ballet) trained many fine professional dancers. Their pre-professional company continues to perform on a regular basis and provides a good training ground. Ms. Valaire was also well known for her knowledge of the classic repertoire and had traveled internationally to set ballets for many companies. Monique Meunier and Anna Liceica and Andrew Veyette are a few of the fine dancers the school has produced. Caprice Walker continues to direct the children’s division of the school. Stanley Holden was an exceptional character dancer with the Royal Ballet. He worked with numerous choreographers and established many distinctive roles. He is best known for his role as Widow Simone in La Fille Mal Gardee, with its famous clog dance. Originally situated at the LA Music Center for a time, he soon opened his own school, The Stanley Holden Dance Center in 1970, where he taught for nearly 30 years. He had a wonderful personality and dancers enjoyed his classes and the school’s professional atmosphere. He employed several of his distinguished RB colleagues on the faculty including Margaret Hills, among others. Professional dancers sought out the school while on tour. In later years, Mr. Holden continued to teach at the California Dance Center in Agoura Hills, north of Los Angeles. The question is often asked: “Why doesn’t Los Angeles have a resident ballet company?” Indeed, there have been articles/interviews written about it over the years. I am not certain there is a full answer. When asked, I have posited some of the following ideas. The usual pattern in a large city is that a musical organization, for example a symphony orchestra, is the first cultural organization to emerge, along with various types of theatre. Art museums are usually established early, often to provide a home for a private collection. Appealing “naming opportunities” for buildings and galleries enhance donations from wealthy patrons. Ballet seems to be the last to arrive at the ball, usually in service to an opera company that needs dancers. This often leads to an attached ballet academy and a separate season for the ballet or a shared season with the opera. Los Angeles is a large and diverse community, often pulling in many different directions with no efficient way to travel and commute to rehearsals or performances. Compared to the east coast, there was not the same amount of “old money” in Los Angeles. Besides the obvious link to established wealth, I think that term often implies “cultured”. Then there is the climate, which affects people’s desire for certain kinds of entertainment as they grow up and seek enrichment. Are they less likely to see a play or concert or are those existential needs met by their ever-pleasant surroundings? In New York, George Balanchine had his patron, Lincoln Kirstein. Kirstein was a cultured and wealthy man of great determination. He recognized Balanchine’s gifts and made a long and determined effort to support him; constantly fund raising, and worked towards founding a ballet school and eventually the New York City Ballet. Does Los Angeles have someone else who is like Dorothy Chandler? Through her wealth and influence in the Los Angeles Times, Chandler supported the development of the Music Center (LA Philharmonic). Or could Eli Broad, passionate about the arts, currently supporting other cultural endeavors, turn his attention to a resident ballet company? Further, there needs to be focused and knowledgeable nurturing from the city and the press which need to help develop a company by using their resources to create audiences. Certainly a company can just be imported and be “plopped into place”. The Joffrey Ballet was a unique company in Los Angeles. I will not take the space here to explain that interesting story. Although I was very sad to see them leave, the studios that were originally built for the Joffrey at the California State University (CSULA) have been put to very good use by the Los Angeles County High School for the Arts (LACHSA) and CSULA Dance Department. There was a brief wonderful moment however during the Joffrey residencies when the company was rehearsing Nijinska’s Les Noces just down the hall. Los Angeles has produced a wealth of well-trained dancers that have performed with major companies around the world. It is too bad that there is not a company in Los Angeles where they could continue to develop their art as well as bring their public an understanding and pride in that art. Classical dancers require a consistent and dedicated training period while the body is still malleable. Then they must move on to use more years to develop performing skills in a company setting. I have encouraged the dancers to go where the opportunities currently exist to build their dance careers usually at major companies in other American cities or in Europe or Canada. There have been many ongoing local groups in Los Angeles that have given short seasons over the years. Efforts were made, by prominent dance artists including George Balanchine, David Lichine and Eugene Loring to establish a resident ballet company for Los Angeles. None of these enterprises was able to be sustained. Not discounting the sometimes-irregular good performances of many local groups in the Los Angeles area, perhaps the largest, most colorful and sustained ballet venture has been John Clifford’s Los Angeles Ballet. Betty Empey, local arts activist and manager of the Los Angeles Junior Ballet invited Mr. Clifford to return to his home in Los Angeles to perform and choreograph some of his works for the pre-professional group directed by his former teacher, Irina Kosmovska. Out of this success, he was approached by sponsors to establish the Los Angeles Ballet in 1975. The company was active for ten years and performed and toured extensively. As an incentive/endorsement from George Balanchine, Clifford’s company was given access to eighteen ballets by the master choreographer for the Los Angeles Ballet’s repertoire. Many additional classics and original ballets filled out the roster, including Clifford’s choreography. The company performed about 200 performances annually and successfully toured nationally and abroad. The company’s affiliated school had 350 students at peak. In 1985 the board of directors disbanded due to the company “difficulties within the arts community”. In 1987, Mr. Clifford was asked to develop a smaller touring group, which continued through 1991, receiving enthusiastic reviews. It should be noted that many groups in Southern California area have done much to preserve and promote a high standard in ballet. Los Angeles Chamber Ballet, founded by Raiford Rogers and Victoria Koenig in 1981, provided unique and original performances and collaborations. Musically adroit and classically based, but with a contemporary feel, Mr. Rogers works are original and well danced. The company has toured and maintained high standards and a devoted audience base over the years. Ms. Koenig, formerly with Elliot Feld Ballets New York, now co- directs the Inland Pacific Ballet and its school in Claremont with Kevin Meyers. Many Ballet companies and their schools have graced us in the southland. A new Los Angeles Ballet Company founded in 2006 and directed by Thordal Christensen (Royal Danish) and Colleen Neary (NYC Ballet) is gaining support in the Los Angeles area. The two co-directors have already brought the traditions of their background together for the new group with works by both Bournonville and the Balanchine legacy. This forms a solid base technically and choreographically for both the classics and emerging works. We wish them well. The passing on of tradition and daily training has sustained our art on the West Coast. These are some of the past, present, and better known: Los Angeles –Stefan Wenta; San Fernando –Rozann-Zimmerman, Milada Mladova, Francisco Martinez, Patrick Frantz; Pasadena — Charles and Phillip Fuller; Santa Barbara — Valerie Houston, Tamara Usher, the Gustafsons, Carrie Diamond; Anahiem — Lois Ellyn, Larry and Sarma Rosenberg; Laguna Beach — Ballet Pacifica founder-Lila Zali and Molly Lynch; San Diego — Maxine Mahon’s California Ballet and the San Diego Ballet. Most of the training emanates from very specific roots in European history and particular ballet masters. I am endlessly curious about the teachers’ links to these traditions, how they received them and how they may integrate useful new ideas and in their training and choreographies. I don’t even know if they can realize at the time the contributions they are making to the students’ lives and their art as they work with them. The philosopher, Havelock Ellis, wrote, “Dance the Loftiest of the Arts”. And on a practical note one could even say, “With good classical training, you can go anywhere”. I recall you with great admiration, Leslie, as well as your brother Greg Kimball. I also recall the beauty of Karel Shimoff and Diane Bradshaw. Memories of Irina Kosmovska’s studio come flooding back. Flo at the piano. Wonderful article Don. At some point I’d like to go into detail why my original LA Ballet was forced to close in 1985 after 10 years. I think enough time has now passed. One correction. I never “auditioned” Damian Woetzel. When he moved to LA with his father, at the age of 15, he came into my studio/school and asked to be a student. I was standing at the front desk and remember this well. He was very poised and well spoken for his age, so I was curious about his background. I asked him why he was coming to our school and he explained he had just moved from Boston and had been studying at the school of the Boston Ballet, then being directed by my former partner, and great NYC Ballet ballerina, Violette Verdy. When Violette learned Damian was moving to LA she had told him he should study at our school. Irina Kosmovska was our head teacher for all the years of our existence. That’s how Damian first came to my attention and into our school. The rest is history. I started putting him into ballets a few months later and did several just for him like THE YOUNG APOLLO (when he was 16) that were very well reviewed in the New York Times, the Los Angeles Times, The New Yorker Magazine, and elsewhere. Darci Kistler was also a student at our school until we were closed, as was Jock Soto (for about only one year). Reid Olson, now one of LA’s most prominent and popular teachers, was a product of our company, and others such as Christopher Boatwright (who danced with us the last 3 years of our company and then went on to a long and illustrious career with the San Francisco Ballet) Andrea Tallis, (Billy Forsythe’s Frankfurt Ballet) Lesli Wiesner, (Zurich Ballet) Caroline Iura, (principal ballerina at HET National Ballet for many years) Ellen Bauer, (who danced with both the National Ballet of Canada, and the Pacific Northwest Ballet before she was sidelined with an injury) and Nancy Davis and James Lane (who now run a most respected school / student company in the Portland, OR area, were all dancers in our company. So far our “original” Los Angeles Ballet still holds the record for longevity in our divers and fickle city. I was very touched and interested in all that you said that has transpired in your life since my association with the LA Junior Ballet. I hope you can contribute more about Irina, Tatiana and the others from that time to this website. I have submitted pictures of some of the Ballet Russe artists to this website and hope they are up soon. Caprice Walker is an excellent teacher and has taught at Westside Ballet School in WLA Santa Monica area-founded by the late Yvonne Mounsey and Rosemary Valaire for many years. She would love to hear from you I am sure. I miss Riabouchinska still. She was such a wonderful human being as well as artist/teacher. I have just found DHP and am so moved. All the old familiar names of teachers and artists are presented and the biographies are are invaluable. One indelible teacher not mentioned at this time was the late Micahel Panieff……I used to secretly attend his classes when I was a young adult as it was not well thought of to visit other classes in those days just as it was frowned upon to ski or play tennis. My late brother Greg Kimble and I felt quite rebellious when we would go off and play tennis. My brother Greg and I were students and members of the Los Angeles Junior Ballet Company headed by Irina Kosmovska and later joined with her and Tania and David Lichine in Beverly Hills. I think we all did the last Graduation Ball personally coached by David and Tania. David had choreographed this many years before and I was privileged to dance Tania’s part of the Romantic Girl (shared with Bonnie Bittner) and Greg ,David’s part of the Drummer Boy. I had the great honor of dancing with Don Hewitt in an original ballet by Irina Kosmovska based on Strauss Waltzes…..I was all of fourteen years old. I have many memories of those days and would love to share them with you all. Recently I have reconnected with many of my old dancing friends and they may want to add to the story of Ballet in Los Angeles. I have stayed in touch with David and Tania’s daughter for many years and she might enjoy writing something. There are dancers I would love to hear from such as Caprice Workman (maybe teaching in the Santa Monica area) and Karel Shimoff Rall who I think is in Washington State somewhere. I danced with them in Irina’s Red Shoes. When I was a kid and misbehaved my punishment was to go with my sister to her ballet lesson. I think the idea had more to do with keeping an eye on me than that ballet was “punishment.” I became a lifelong fan. The teacher was Rozelle Frey and her studio was on 6th St. at Alexandria Ave. near downtown LA. I drive by there occasionally but I can’t tell which of the nondescript storefronts was the studio. Later, I played in the orchestra of the San Francisco Ballet (the Cynthia Gregory era) and, briefly, with the Joffrey in LA before Gerald Arpino got mad, left, and took his ballets with him. One of his pieces was Two A Day, music by Elliot Kaplan, who said he wrote the soprano saxophone part for me. I thought of all this when I read that Maria Tallchief had died.